I have a few questions about my press. 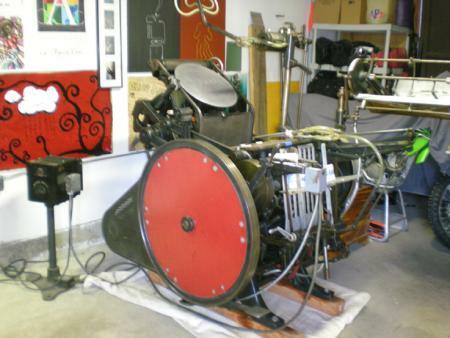 She is a beautiful 10x15 Kluge, with a perfect motor and Variable Speed Control. She is running on 220 power currently. I want to slow her down to a more manageable speed, but the limits of my speed control are set to the slowest speed and she is still to fast for my tastes. My first question is whether rewiring the press to 110 power would actually slower her down or make her faster? The plate on the motor seems to say it will go from 900 RPM’s to 1800 RPM’s if I go to 110 power. My second question is whether or not anyone has wiring schematics to actually make this power switch happen correctly? My last question is only applicable if the first two don’t work. Has anyone fitted a new speed control onto an old motor to be able to slow it down? If so, do you have any information on what speed control works best? Save your money on rewinding the motor. How the motor is wound or if it is wired for 115V or 230V does not have any effect on the speed of the press. That is the speed controls job. Most likley your problem is in the Cutler-Hammer speed control. The speed control lowers the voltage thru resistors to slow the motor down. Check the RPMs on the motor to see what the speed range is. If the RPMs don’t go down to 900 you probably have some burned out resistors. If you are so inclined the go into the speed control check it for bad resistors. If some are burned out you may be able to replace them. If not the easiest way to get the press to run slower is to put a larger pully on the motor. Measure the pully size on the motor and calculate the ratio between it and the pully on the press. Then you can determine what pully size you need to slow the press to the speed you want. I don’t think running the motor this way will hurt it. However if there is a question put an amp meter on the motor and check it out with the press at max speed and minimum speed with the press inked up. 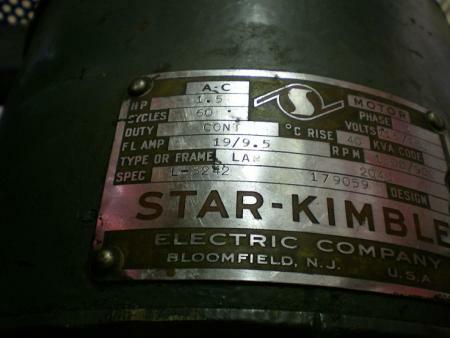 Check your readings against the name plate amps on the motor. 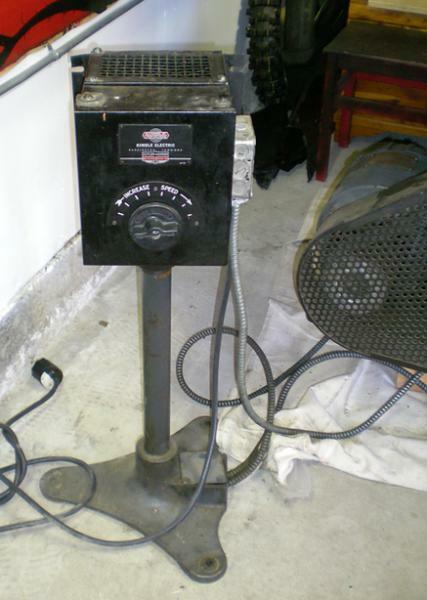 Best to about 80% of FLA.
Years ago I had a similar, but older, pedestal rheostat speed control on a C&P. The wiring inside the box could be set for a slower speed range or a faster speed range. The instructions were pasted inside the box. Your control might work the same way, so I’d suggest looking inside (unplugged of course). This 10 by 15 Kluge looks like a beauty I used exclusively for numbering. It had a 1665 rpm constant speed motor. The press moved way too fast, so I reduced the radius of the pulley on the drive shaft (motor) by 1/4 inch, from a diameter of 4 inches to 3 1/2 inches. The slowest speed at which the press would run was brought down to something manageable, around 1500 iph. And it didn’t involve tweaking the national power grid! Did this press come from Texas? you need to find out if the motor is slowing all the way down. set speed control to slowest setting then count the revs of the fly wheel in 15 seconds. mult that by 4, you now have RPM for the flywheel. the gear ratio is proportional to the diameters of the 2 two pulleys but inversely proportional to the speed. so, stop the press and measure diameters of the fly wheel pulley, (actual belt surface not hand surface) and then the drive pulley dia. simply cross multiply: D is fly wheel dia; d is drive dia; R being rpm of flywheel; r resulting rpm of drive pulley. with these dimensions and speed, this fictional motor is turning 1,000 rpm. you need a smaller pulley on the motor to run slower. the numbers on the plate prob represent a “no load” rpm, so your speed measured this way will prob be less than stated. find an OLD electrical engineer to help, young whippersnapper might not know what to do with this. possibly keep your ears open for a gear reduction box. it would take some mechanical work but, it would keep your hands out of electrical. i will call someone on this. Good Luck! cmcgarr - This press did not come from Texas. I got it from a local printer here in San Diego. He may have got it from Texas, but it would have been upwards of 20 years ago. I appreciate all the help on figuring this out. It is something that has been holding me back and I am ready to move forward. ericm - Thanks for that information, looks like I’ll have to break out the graphing calculator that I put away back in high school. I will take a look and some measurements to see what is the facts on the RPM’s and pulley measurements. Also if you find someone with a gear reduction box just let me know. I am starting to see that there is lots to soak in and this is only the beginning. Again, i appreciate all the info. if you can post serial number of press it MIGHT help me in dealing with my resource. Here is the model number on the press. For some reason the shot is not showing up for me above. The model number is MB103713. ronwhistler - see the help section on Why won’t my photos upload? Just wanted to update you on how we got the Kluge to slow down. We threw another motor on that is a lower horsepower. The fastest speed of this motor is perfect now. I am really excited to get to printing. The Kluge has been looking forward to this and so have I. Thanks for all the assistance everyone. I caught on to this post a little too late. Looks like you found yourself a solution. 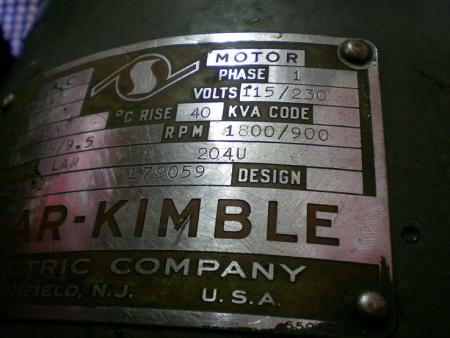 My C&P has a Kimble speed control that looks suspiciously similar to yours (also has a 1.5 Hp motor). In a long chain of events while hooking up my press for the first time I ended up getting in touch with someone over at EATON (previously Cutler Hammer - who either built these for Kimbel, or Kimbel later became Cutler Hammer) that was kind enough to dig back in their archives to 1936 & provide me with the schematic for my controller. If you’re interested/still have use for it, email me - I’d be happy send you a copy (I have it as a PDF scan). PS - Even at the controllers slowest speed, I ended up reducing my motor pulley/sheave diameter too. I would really appreciate the schematics for that motor. Even though I found a solution, it would be nice to have. With these older items it is always nice to have more info than you actually think you need. Your press looks nice by the way. Thanks - yours too. I didn’t have a closeup photo of my controller handy, but I’m sure you recognize it there on the wall. I get that sent off to you right now. I know I’m digging up an old post. Jason - Any chance you would still e-mail a pdf of the schematic. Sure, happy to share… you should have it by the time you see this. PS: Glad I saw & read this thread, you can contact users directly through their profile in the future to be sure your message gets to them. are you still using the old speed control? if not i may know of someone who might want to buy it.